I haven't done a clan update in a while, so I figure it's about time all of my readers (am I talking to myself?) find out how my crabs are doing and what's going on as of today. Pictures of each crab are included, but none of them are too recent. I will list them in the order I've acquired them. Mako is currently the crab I've had the longest. 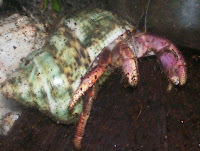 He is a purple pincher and is currently dug under the substrate and in the same shell as Shinto (tapestry turbo). Mako molted in April, so I am assuming he may be pulling off another molt. Oddly enough, he went down the same time my Viola went down. I am praying there are no troubles there. 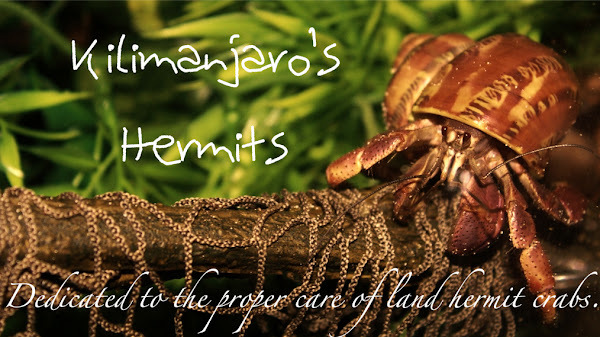 Pompeii is currently my only Ecuadorian hermit crab with me, as Kilimanjaro has passed a few weeks ago. Needless to say, Pompeii has been walking around the tank aimlessly... I think she may be trying to find another Ecuadorian to hang out with! I am hoping to find her a species buddy soon, but with money situations, I am unable to at the moment. Pompeii is my only crab that is actually on the surface! Ryukyu, my "prized-possession", is finally molting! I am a bit worried because Shinto and Mako followed him down. 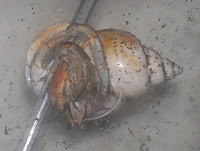 Both of those crabs are due for a molt, too. I am just hoping there are no troubles. I am really worried about Ryu's first molt... him being an exotic an all. I am just hoping that all goes well and I can see him in a month or so when he resurfaces! Shinto, my newest purple pincher and also the crab I've had for the least amount of time, has finally decided to go down for a molt! He has been surfaced and digging since I've acquired him in February, so I am so happy he is finally deciding to get it done and over with! The only problem with is molt is that he went down in the same area as Ryukyu. I am really worried about my Viola! And that is the clan update!